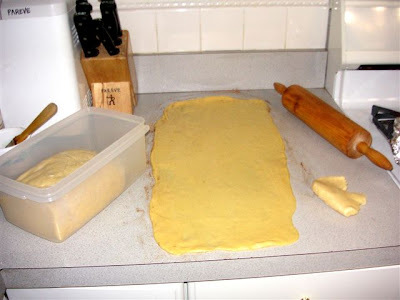 Here's how I make strudel dough in the bread machine. One batch makes one HUGE strudel or two normal (10-15 servings) strudels. 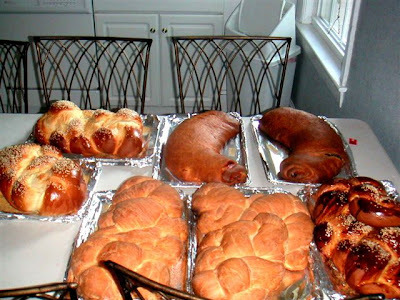 This is the same dough I use to make crescent rolls for shabbat breakfast. It also makes a nice apfelkuchen or pflamenkuchen base. 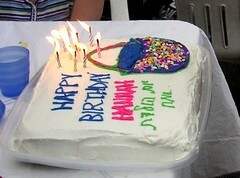 Cover with simple confection-sugar-and-water icing when cool. 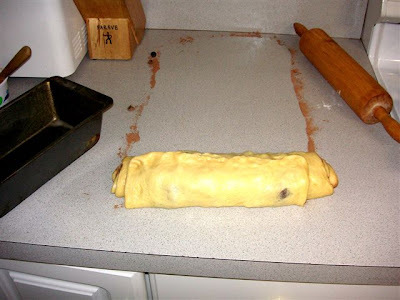 Place the rolled up loaf, seam-side in a greased pan. 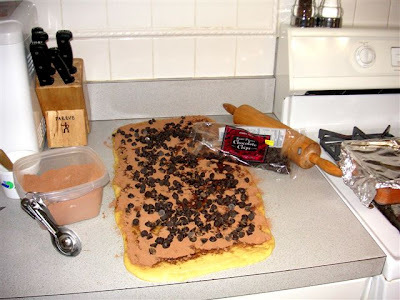 The excess/spilt cocoa can be put on top of the loaf. I like to do this, especially when making a bunch of different types of strudels, because it helps identify the contents. Also, I hate to waste anything - most particularly chocolate! Make a simple icing by putting a cup (or less) of confection sugar in a bowl, add hot water by the tablespoon, mix well until it behaves like a spreadable icing. Drizzle it on the cooled competed loaf. 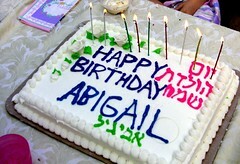 One of the favorite fillings is marzipan. I buy mine from Bierman (OU pareve) at Amazon in 5lb. blocks . One 5lb block makes 6-8 strudels, generously filled. I have found this to be a delicious brand of consistent quality. I've tried buying more than 5 lb. at once, but it tends to dry out after a couple of months, even when kept in an air-tight container. Less than that isn't cost-effective, when the cost of shipping is considered. 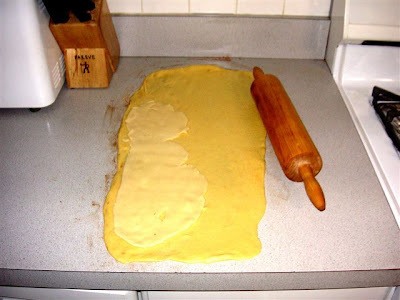 Don't worry that the marzipan fills the dough's surface completely. Patch it together as best you can. 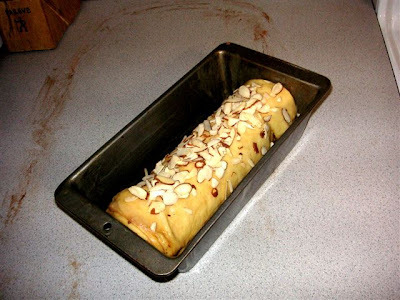 Sprinkle the top of the uncooked marzipan strudel with slivered almonds. They'll brown up in the oven. 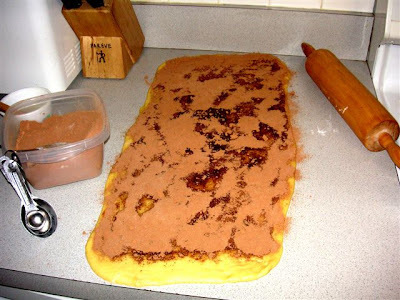 On top of the margarine-covered dough, sprinkle brown sugar and cinnamon. Sometimes I add raisins, dried cranberries, and/or chopped walnuts. 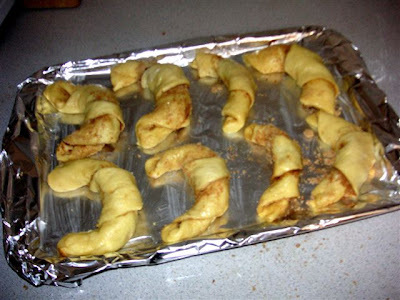 One recipe yields 16 crescents. Cut the circle into eight wedges. Roll each wedge, starting from the arc to the point (middle of the circle) and place on a greased pan, leaving room to rise. 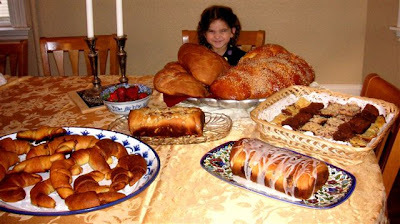 In the upper right hand side of the below picture, you can see two HUGE strudels. They had fruit filling. 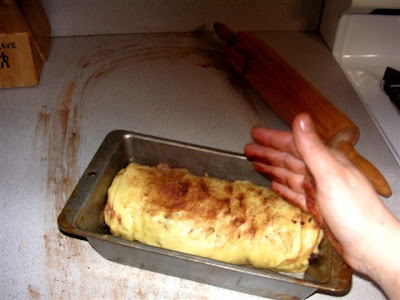 I used to make two HUGE fruit-filled strudels every week (and would cover them in drizzled icing, as described above.) Last year, however, I started making four of the strudels that fit in the 9x3 pans, as above each week, instead. The idea was to reduce waste and stock the freezer with one or two strudels per week, for "dessert emergencies" and for giving away. This has worked very well. The full recipe strudels pictured below would work for very large (20+) crowds, but are impractical for smaller groups. If you look carefully, you'll see tiny pieces of paper labeling the types of strudel fillings on the inside of the strudel's curve. I used to make (at least) two different types of filling each week. 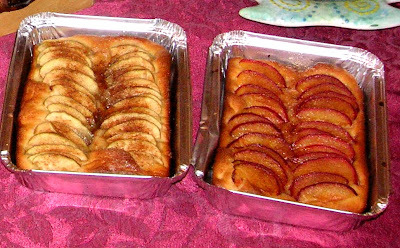 Once baked, you couldn't tell which was which. 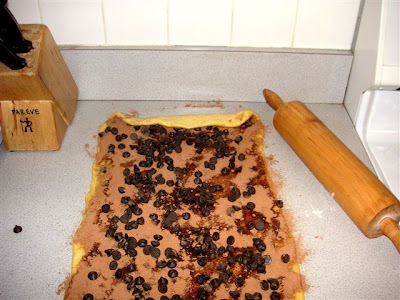 To identify them, I'd put a piece of paper with the filling's name on the greased pan, and bake it along with the strudel. Then, when it was time to serve the two strudels, I'd put each on a platter with its label discreetly tucked near it. 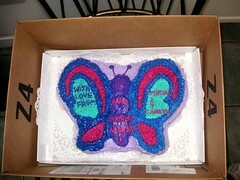 This way, my husband could offer the guests their choice, and know which filling was which, before cutting into them. Grease the pan. 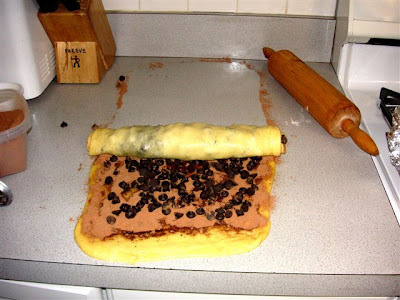 Press the dough into the pan. Brush with melted margarine. Slice apples or plums as thin as possible. 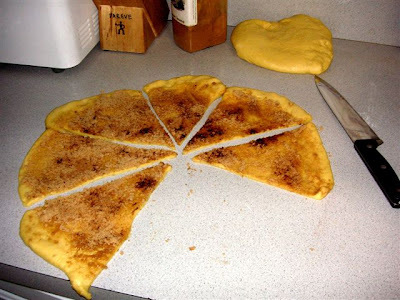 Lay the fruit slices on top of the margarine-coated dough. Paint the tops of the fruit with a very thin layer of melted margarine. Sprinkle cinnamon (and, optionally, either brown or white sugar - I omit this) on top of the fruit slices. Bake at 350 degrees F for 20 minutes. How long do you leave the dough in the bread machine for? What if you wanted to make this by hand? I think we're probably as far apart religiously as possible, and yet I love your blog. 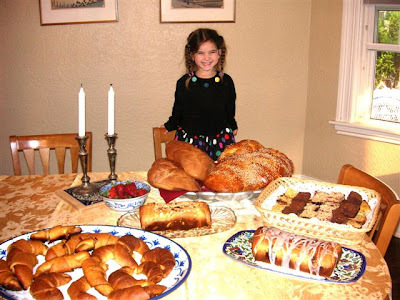 Cute kids, great stories, interesting philosophy, and neat recipes. 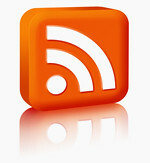 Thanks for blogging! Very impressive. 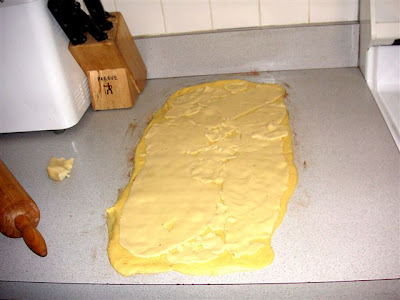 I hate doing anything with dough. @anonymous:The bread machine dough cycle lasts 1.5 hours. The machine kneads the dough and gives it a gentle heat. It might take a bit longer than 1.5 hours by hand, because of the lack of this heat. It depends on the temperature (and perhaps humidity) of your kitchen. Just let it rise until double in bulk, and punch it down. Then you can continue with the instructions in this post. That's one of the benefits of making dough in the bread machine: It handles the sticky parts, and you get to play with the smooth and dry dough. The secret about working with dough, is that once you know how it behaves, most doughs are very forgiving. There's a lot of flexibility with timing, etc. I'm a private person, but somehow, editing a file and hitting "publish" doesn't feel as public as I guess it really is. Thank you so much for this recipe. 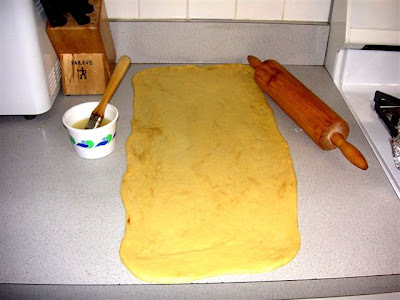 The best strudel dough recipe I have come across! I made a beautiful apple and a cherry peach! I think next time I get to the store I'm going to try marzipan and chocolate! thank you for the recipes. 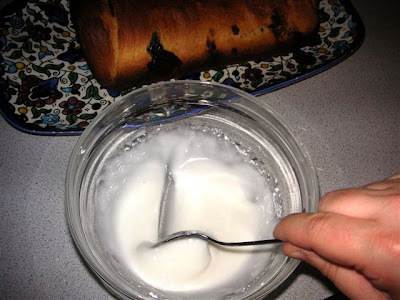 i just wanted to add that i have tried using olive oil instead margarine and it worked just fine. 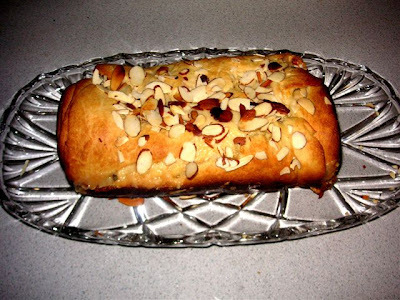 I know it's been a while since you've made this post but thanks for sharing the recipe! 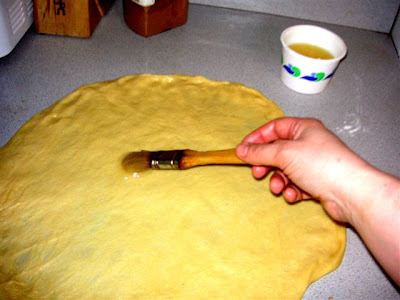 I've been looking for a good apfelstrudel recipe for some time now and I despise using store bought puff pastry if I don't have to for anything, since I know most of the methods I have come across, use puff pastry. I find it a little peculiar because all the times in which my Dad brought home strudel from the Bavarian/German mart, it never tasted anything like puff pastry! That looks interesting, thanks for the recipes. From: Yeo Keng Juan, Alan. Excellent. 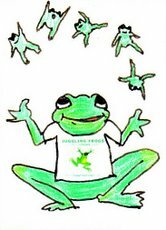 Please keep the strudel info up...wonderful pictures for us to follow. 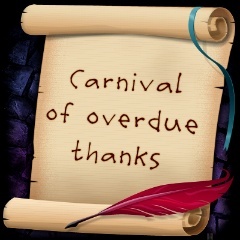 We appreciate your time and effort to share with us. Senior Gift from our PTA: "A Maimonides Reader"
Q. Why did the turkey cross the road? "She's such a hypocrite, Mommy!"